Danny Garcia vs. Brandon Rios in the works for Dec.
A fight between former 2 division world title holder Danny “Swift” Garcia (33-1, 19 KOs) and Brandon “Bam Bam” Rios (34-3-1, 25 KOs) is in the works for December, according to Rios. The fight is being negotiated right now for December in New York. Garcia, 29, has had a number of top welterweights calling him out, but it appears that he’s more interested in fighting the 31-year Rios. IBF welterweight champion Errol Spence Jr. offered to give Garcia a title shot. Shawn Porter also has asked Garcia for a fight. The idea behind a Garcia-Porter fight is the winner would then face WBA/WBC welterweight champion Keith “One Time” Thurman. Garcia has shown little interest in fighting Porter. Danny Garcia vs. Rios would be a similar fight for him to his past matches with fading fighters Robert Guerrero and Paulie Malignaggi. Like those fighters, Rios was once a world champion and highly respected when he was fighting at lightweight. Things haven’t been going well for Rios since 2013, with him losing to Mike Alvarado, Manny Pacquiao and Tim Bradley. Rios should have had a loss to Diego Chaves as well. The referee stopped the fight suddenly, disqualifying Chaves for throwing an elbow. Rios was behind at the time in the fight with just 1 round to go. In looking at the replay of round 9, I couldn’t see where Chaves threw any elbows. Rios was getting worked over by the Argentinean fighter and looking really bad. “My understanding, right now, they’re working on the Danny Garcia fight,” said Rio told Fighthype and other boxing media. “I think they’re talking about the second week of December or late December. We’re going to do that fight in New York. We’re in negotiations right now with that fight. That’ll be my next fight. He wants it. I want it. He says he wants to fight me in his next fight. We’ll have to see how the fight goes. We both can bang. We both have power. So we got to see how the fight plays out when it happens,” said Rios. Fighting Rios is going to make Danny Garcia look like a cherry picker in the eyes of the boxing fans. Fighting Rios would be a good move for a lower ranked fighter in the welterweight division. A bottom feeder contender facing Rios would be perfectly fine. But it’s not a good look for Garcia, who is highly ranked at #2 WBA and #2 WBC. Moreover, Garcia has options for big fights against Spence and Porter. Garcia came up short in his last fight in losing to Keith Thurman by a 12-round split decision on March 4. Thurman easily controlled the fight through the first 5 rounds. He let off his foot on the accelerator in the last half of the contest, allowing Garcia to creep back into the fight. It could have been a very easy fight for Thurman if he had kept fighting hard instead of coasting in the last 6 rounds. There might be a stamina issue with Thurman. He had Garcia so badly outclassed that he could have embarrassed him if he had fought hard for the second half of the contest. It wasn’t even a fight when Thurman was attacking the slower, more limited Garcia in the first 5 rounds. 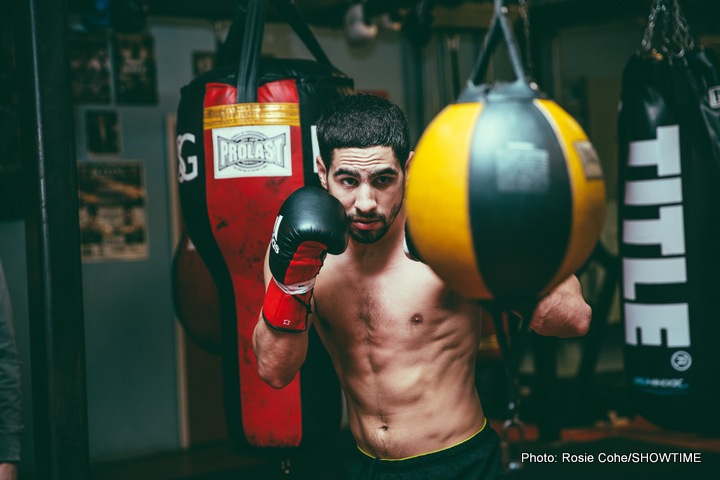 You are here: Home / Boxing News / Danny Garcia vs. Brandon Rios in the works for Dec.